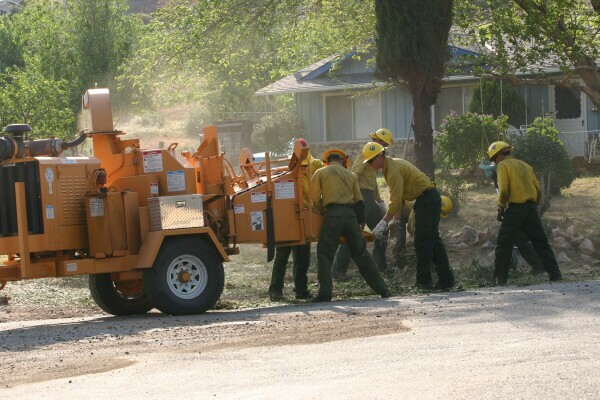 All material should be stacked alongside the roadway in several small piles rather than a few large ones (because it takes too long to separate the brush), accessible to the chipper crew. No material should be greater than 3” in diameter. Pine slash should be cut at least 7 days prior to chipping. Freshly cut pine may stimulate bark beetle feeding and attack healthy trees. Following the project the chips could be broadcast back onto the property or collected and then made available to property owners to spread on their property for garden mulch, dust abatement, to limit weed growth and inhibit erosion. Material should be freshly cut, green material chips are better than old dry vegetation and is less wearing on the equipment. All vegetative material should be free of rocks, dirt and other foreign material that could damage the equipment.